More than 4,000 internal medicine program directors and coordinators submit nearly 40,000 trainee evaluations to ABIM each year through FasTrack, a clinical competence evaluation system. These evaluations indicate which residents and fellows are meeting the competency requirements necessary to demonstrate eligibility for initial certification in internal medicine or one of its subspecialties. Unfortunately, over time, the system for collecting this information became outdated, with training program directors reporting that the process of entering evaluations was unnecessarily time consuming, frustrating and confusing. In response to the recommendations of training program directors and coordinators for improving the system, we worked to better integrate FasTrack with the Accreditation Council for Graduate Medical Education (ACGME)’s Accreditation Data System (ADS), a system into which program directors now must enter training milestone data twice per year. This past July, a redesigned system was launched which significantly reduces redundancy. 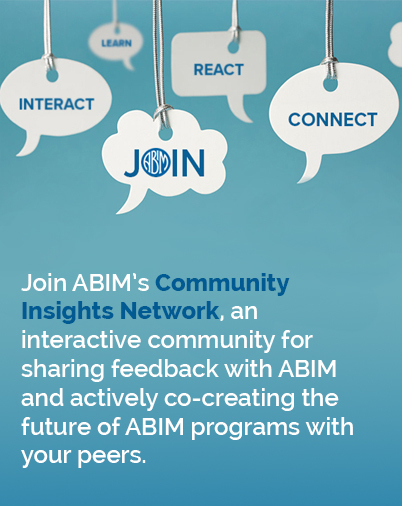 Through ABIM staff collaborating with program directors at their annual meetings to test and refine early design concepts, we were able to ensure that the features and options in the new system are user-friendly. Early results from a survey of all FasTrack users overwhelmingly indicate that the new system is faster and that the process of submitting trainee evaluations is much easier. We’re thrilled with the positive feedback, but we aren’t done yet; survey responses also include many great ideas for additional features and improvements. ABIM is working hard to make all of our programs, including Certification, Maintenance of Certification and related online tools, more intuitive and user-friendly. If you have suggestions, thoughts or feedback, we’d like to hear from you.